For the first July edition of SUT, I wanted to feature one versatile piece (which I just purchased for myself!) and show different ways to wear it for work & play. 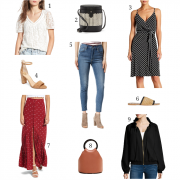 I kept the palette simple for both looks, but this skirt would also be perfect with a polka dot top (hello, print-mixing!) & ballet flats or a chambray shirt (tied in a knot at the waist) and espadrille wedges. 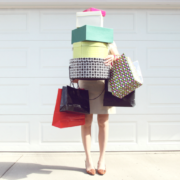 The best part is that every single item listed below is less than $30! Both options, the office and the weekend look amazing!! Love the idea! That ASOS pencil skirt and aldo sandals I love!! I'm having a your choose cashmere giveaway on my blog, would love for you to pass by and enter I think you'll love it. Love it, you always have such chic style. Now I must hunt down that shirt from H&M. in love with your striped skirt! can't wait to see you wear it! 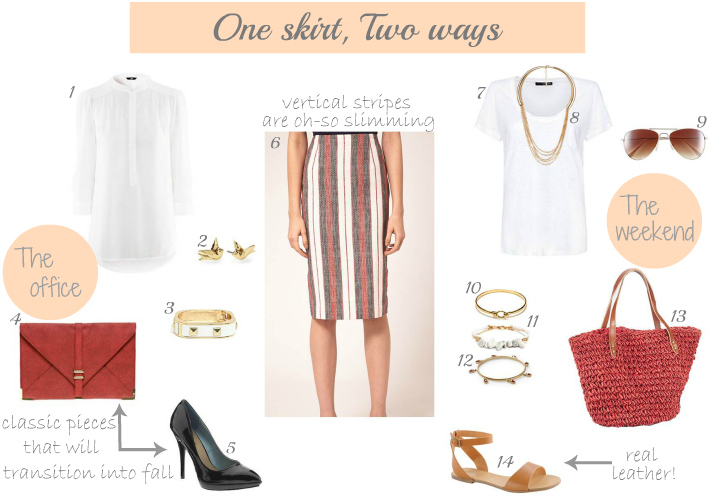 LOVE that pencil skirt – the vertical stripes are SO cute, and so are both ways you styled it! That is such a cute skirt…vertical stripes should be super flattering! Such a great skirt! I love both looks that you put together. You styled the pencil skirt we were both eyeing – I love it! 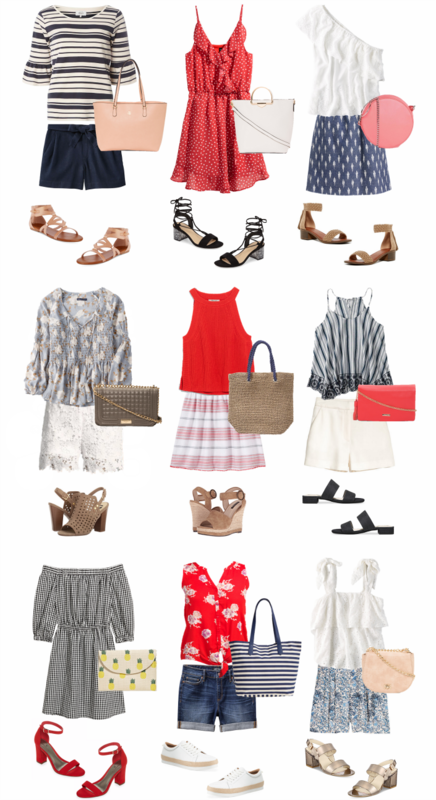 These looks are perfect for the 4th, too. I think I am digging the laid back look – especially with those sandals. Cool & casual. I think both of these looks are so cute! Love both, especially those ALDO flats! Not sure I could pull off a pencil skirt and flats like this but I'd def. wear with a pair of major heels like you found! I love it! What a great piece to match with EVERYTHING. The skirt looks slimming for sure, although for those of us who stopped growing at 5'3" (to focus on other interests), that length is not as flattering, especially with flats. I think if I were to wear that skirt I would hem it a few inches so it fell just above the knee. I like both of these styling options. I look forward to seeing you wear this skirt soon! Such good deals here! Love the combos! That Asos pencil skirt, yes, please! I always have the hardest time not purchasing everything whenever I go on the Asos site! Also, those aldo flat sandals are a great find! SO SO CUTE! That skirt is amazing and I love how you paired it. I would totally wear the weekend look! And those stripes must be super flattering! I love this look! So affordable yet chic.